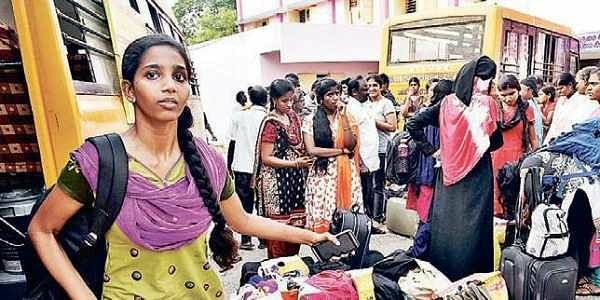 MADURAI &CHENNAI: Leaving the NEET aspirants in a fix, the CBSE, at the eleventh hour, has moved the Supreme Court, challenging the Madras High Court order directing the board to reallocate the examination centres to Tamil Nadu students within the State. Announcing that the NEET exams would be conducted on May 6 for undergraduate medical courses, the CBSE issued the admit cards to the Tamil Nadu students, allocating then examination centres in states like Kerala, Karnataka and Rajasthan. After a case was filed, Madras High Court, on April 27, directed the CBSE to reallocate the examination centres. But the CBSE’s non-adherence to the court order has put the NEET aspirants in jeopardy. In the last minute, the CBSE has approached the Supreme Court. When Express contacted Sanyam Bhardwaj, Director of NEET (New Delhi), who on Tuesday maintained that they were yet to receive the High Court order, refused to comment on the move of approaching the Supreme Court. School Education Minister K A Sengottaiyan said only CBSE students were allotted centres outside the State. “The government will ensure that students of government or government aided schools will get centres in the State itself,” he added. For most of the Tamil Nadu students, the NEET was a rude shock and a tough challenge last year. But, the special residential coaching centres run by the State government this year seem to have instilled confidence in the medical aspirants. With only three days left for the exam, they are on the last leg of revision. “We solved at least 10 model papers during the residential coaching. We would have had no idea on how to face the paper, if not for this training,” said A Raghavendra, a student from Chennai. He attended the 25-day long residential training at Sathyabama College. About 300 students from across the State attended the crash-course with him. The school education department on April 10 set up nine residential training centres across Tamil Nadu. “Teachers picked the toppers in our school who were interested in taking up the exam and sent us for the course,” said P Aishwarya, a student. “About 3,000 students who had registered themselves for NEET alone were permitted into the course. Students were provided with books, learning resources, food and accommodation,” said an official from the school education department. Many students who attended the training said that they found the crash-course more useful than the weekend programme which the government launched last year. “We couldn’t attend many of the classes in the weekend classes as it overlapped with our school tests and we couldn’t travel far on weekends for these classes,” said Faiz from a government school at MGR Nagar. He added that this course was intense. The Central Government headed by Modi and the State Government by Edapadi, Palanisamy are playing with the future of Tamil student and our Prime Minister has taking revenge on Tamilnadu for showing Black flag during his visit to chennai , and the our CM is dummy and obeying the orders of Mr. Modi., as long as these people remain in power, people of Tamilnadu will face these kind of humiliations and Our P.M, Is not bothered about Tamil people and he taking revenge on our people. Its unfortunate that some of the NEET aspirants has to undergo this unnecessary pressure with exams just 3 days to go. Atleast supreme court should announce its verdict within this evening so that parents and students can plan accordingly. Its really unnecessary pressure.